Where to Next?? 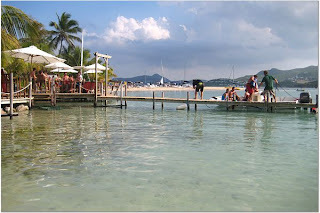 : Don’t Miss Pinel Island off St. Martin! If you find yourself on St. Martin, I highly recommend an excursion to Pinel Island on St. Martin’s east end. Very small, very laid back and very pretty! Pinel Island is called Isle Pinel, or in French Ilet Pinel or Ile de Pinel. We parked our jeep in the village of Cul-de-Sac, located just past the spectacular Orient Bay, and mingled with the friendly wild donkeys roaming around in the parking lot. We caught the small boat to the island around noon – I wish we had caught the first boat so we could have spent a full day! The shuttle boat leaves every 30 minutes from 10am to 5pm and the ride costs $7. The ride takes about five minutes and the water is very calm. Once on the island, paradise! We checked out our surroundings on this tiny little island lined with sandy beaches; the calm, crystal clear, sparking water was absolutely stunning! The view of St. Martin in the distance, with its hills, was just amazing. We brought our own snorkel gear and explored the reefs along the snorkel trail. We found a trail and took a small hike to the other side of Pinel Island, which offered sea grape trees and a completed deserted beach and enjoyed the tranquil silence and scenery. The island offers three little restaurants, Le Karabuni, the Yellow Beach restaurant and Up on the Key, as well as a small gift shop. Since we had already had lunch, we didn’t try any food but Pinel Island sparked my never-ending love for pina coladas. We bought a couple rounds and drank them on the beach, savoring the tasty treats topped with just enough delicious ground nutmeg. After a couple drinks, we relaxed in the shade of some umbrellas on the beach. To this day, I have never tasted a pina colada as tasty as the ones I drank on Pinel Island. Around 5pm, we reluctantly caught the last boat back to the mainland with the rest of the stragglers on the island. Seems we were not the only folks who wanted to spend more time there – the boat back to St. Martin was packed! 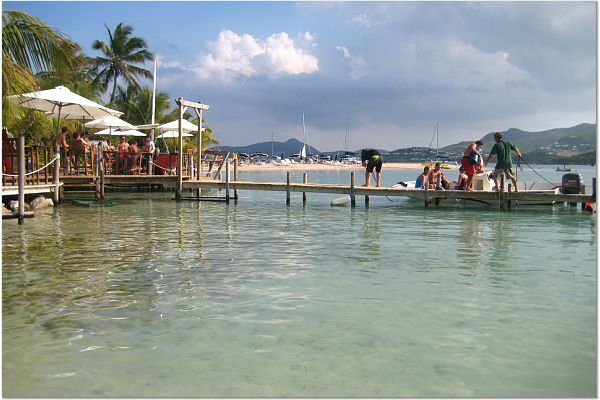 To learn more about Pinel Island, click here. A few more pictures - enjoy! Look like y'all had a blast! I've never been to St. Martin except in transit to Anguilla, and island I really love. I'm a book and travel blogger. I'm an old follower of yours and I'd love it if you'd drop by my blog some time, too. Thanks for stopping by! I have been offline a lot this summer but do check out your blog and really enjoy it! I loved your blogs on Anguilla and am kicking myself for not going there while on St. Martin. I am an avid reader as well so I look forward to more reviews, always trying to find a great book! Hi LDub, thanks for reading...and I really like your blog! I would love to get back to St. Martin and show my husband Pinel...hopefully sometime soon! We share your love of the Caribbean but have yet to repeat an island/trip - we want to see them all! i wanted to ask if you think it would be easy to catch a cab to and from the Cul-De-Sac..my hubby and i will be coming off a cruise ship for one day and wanted to go to Pinel..since we wont have a car, how difficult do you think it would be to hail a cab there? I am mostly worried about getting a cab BACK to the ship....do cabs frequent this spot? Hi Fluffy, I don't recall there being any cabs near the parking lot at the ferry...just a few donkeys lol. Perhaps you can ask the cab driver to come back and pick you up at a certain time? This might have changed, it's been a few years since I have been there.